Co-founder and CEO Max Kanter says the company has developed a way to automate “feature engineering,” which is often a time consuming and manual process for data scientists. “Feature Labs helps companies identify, implement, and most importantly deploy impactful machine learning products,” Kanter told TechCrunch. The company achieves this by using a process called “Deep Feature Synthesis,” which create features from raw relational and transactional datasets such as visits to the website or abandoned shopping cart items and automatically converts that into a predictive signal, Kanter explained. He says this is vastly different from current human-driven process, which is time-consuming and error prone. Automated feature engineering enables data scientists to create the same kinds of variables they would come up with on their own, but much faster without having to spend so much time on the underlying plumbing. “By giving data scientists this automated process, they can spend more time figuring out what they need to predict,” he said. It achieved that in a couple of ways. First of all, it has developed an open source framework called Featuretools, which provide a way for developers to get started with the Feature Labs toolset. Kanter says that they can use these tools to build small projects and get comfortable using the algorithms. 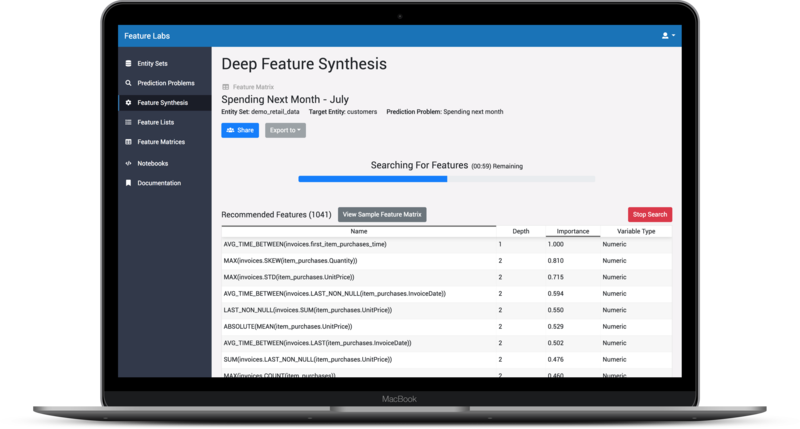 “The goal of this initiative is to share our vision by giving developers the chance to experiment with automated feature engineering on new machine learning problems,” he wrote in a blog post announcing the company launch. Once a company wants to move beyond experimentation to scale a project, however, they would need to buy the company’s commercial product, which they are offering as a cloud service or on-prem solution, depending on the customers requirements. Early customers include BBVA Bank, Kohl’s, NASA and DARPA. Feature Labs products have their roots in research by Kanter and his co-founders Kalyan Veeramachaneni and Ben Schreck at MIT’s Computer Science and AI Lab at MIT, also known as CSAIL. The idea for the company began to form in 2015 and over the last couple of years, they have been refining the products through their work with early customers, which has led to today’s launch.